One of the aspects which, I believe, separates sport heritage from other forms and types of heritage is that it is often corporal in nature. That is to say, sport heritage requires us to continue to play and to watch sport in order to both compare with the past and to create more sport heritage for the future. It must continually be made and remade through play, performance, and spectacle. No heritage building is more “dead” than an empty, abandoned stadium. 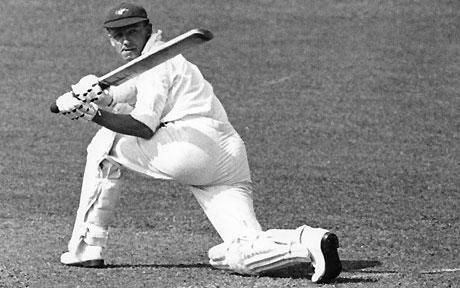 Every boy who has defended a lamp-post wicket is in blood brotherhood with Bradman, and knows Hobbs or or Sutcliffe as himself…every man who has by reflex action or conscious effort flicked a boundary past point knows a thrill of intense physical delight when he sees Woolley bat. In many ways, this goes beyond simple childhood imagination and flights of fancy, and rather an understanding of what it’s like to be a sportsperson. When I was an ice hockey goaltender in my youth, for example, it wasn’t that I was prentending to be Grant Fuhr or John Vanbiesbrouck or Ron Hextall when I played, but rather that I knew – like them – what it was like to make a fantastic save or let in a bad goal. We shared an emotional connection that only we, as goaltenders, could understand. Perhaps our ability for empathy – or, perhaps, our desire to feel empathy for the sportsperson – makes certain sport heritage experiences both desirable and memorable. One of my earliest memories of being at a sports museum was at the ski jump simulator at Canada Olympic Park in Calgary, Canada. Using a point-of view immersive film screen, hydraulics, and several industrial-sized fans, the simulator gave me a taste of what it might be like to ski-jump, and provided me a level of empathy and understanding that wouldn’t have been possible by simply looking at the ski jump tower. Of course, it was also a mediated form of authenticity – I could “ski jump” without actually ski jumping. However, I never forgot that experience, nor could I ever forget the sensations and emotions it created. It is also top of mind every time I watch ski jumping at the Olympics, knowing something of what each skier must be feeling. Naturally, the ability to experience something of the athlete, particularly in a unique and historic place, is also one of the features that sets sport heritage apart. It can also be a way for visitors to create connections – such as fandom and support – with particular athletes, teams, and sports. Of course, all heritage sites – to some degree – use empathy by, for example, comparing our lives to those of our ancestors. However, these are more cerebral connections; they are not immediate and current in the same ways that sport is, and perhaps not as sensually felt. We often don’t think about empathy as a topic in heritage, and it seems that sport heritage might be a good vehicle for exploring it. By Gregory Ramshaw in cricket, England, heritage, history, museum, Research, sport, stadium, tourism, tours on August 25, 2015 .